Virginia Preservation Toolkit: Why Preserve? Why Save Your Historic Windows? There are compelling reasons for us to conserve energy — whether it's to lessen this country's dependence on foreign oil, reduce the greenhouse gas emissions that scientists say contribute to climate change, or simply to save money. Whatever the reason, conserving energy begins with good stewardship-taking care of what we already have. If we are good stewards of our natural environmental resources, then it makes sense that we care for our historic-cultural resources, too-the older houses, neighborhoods, towns, and cities where many of us live or work. This website is for owners of historic homes or buildings who want guidance on how to make their places more energy efficient. It is also for people who care about "green building" issues. It offers how-to information about weatherizing historic houses and explains why historic preservation makes for a greener, more environmentally sustainable community. Environmental leaders concerned today about climate change advocate for new "green" buildings and "sustainable" building practices. In so doing, it is important to remember that the greenest building is the one already standing — especially an historic building or house. Most historic buildings and dwellings were constructed to adapt to seasonal climate changes and to last for generations. Typically they also offer sustainable design features that many green practitioners advocate for today. Think of historic buildings and neighborhoods as renewable resources — to be recycled to meet today's needs; to be sustained to enrich the lives of future generations, who can then readapt them to their own particular needs. 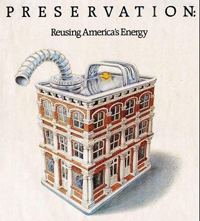 Moreover, keep in mind that when we preserve an older building or neighborhood by retaining its historic character, we help our environment by making better, wiser use of what is already built. By recycling older buildings, we give them new life, and we save both the energy and resources they embody. We also save the energy and resources that would be spent in demolishing them and replacing them with new buildings. The first step toward good stewardship, like charity, begins at home. Historic buildings are durable. Their authentic high ceilings, natural cross ventilation, self-healing lime plasters, and operable, heart-pine windows are naturally efficient features that can be preserved and maintained to last for many more years with the help of good advice and skilled craftsmen. We rightly teach our children the value of recycling aluminum cans. Did you realize that the demolition of 10,000 square feet of an old building wipes out the environmental benefit of recycling 2,688,000 aluminum cans? Rehabilitating historic buildings is the ultimate recycling project.